This debacle would have been laughable if it wasn’t true, but unfortunately it was true. It was fascinating to follow the story develop and how a whole community was gullible to the ‘sound bite’ of the false headlines. It has been widely documented in the scientific community about the, in general, poor reporting of scientific research in the mass media and the need to sell ‘newspapers’ (for eg, see: Misrepresentation of Randomized Controlled Trials in Press Releases and News Coverage). Fortunately the story here only involved the issue about if running shoes cause osteoarthritis and not something more serious like cancer treatments or the use of vaccines where the misunderstanding of a unrepresentative headline could potentially have dire consequences. If you follow what happens in various online communities and how they respond to the misreporting and misunderstanding of research, the patterns of response are similar, particularly when the misrepresentative headline supports a particular view but the actual research reported on did not support the headline. One of the key findings was 38% increase in knee varus torque in the running shoes condition compared to barefoot¹. Some of the key issues with this study was that it was on a treadmill (so may not be applicable to overground running); was not on habitual barefoot runners (where the joint torques or moments may or may not be different); did not report what torques or joint moments went up in the barefoot group² (you can’t get a reduction in a joint moment in one joint without getting an increase in another load somewhere else); and, most importantly, was not a study on osteoarthritis or injury (it was a lab based biomechanical study). Even though it was not a study on osteoarthritis, that did not stop the journal putting out a press release with the headline of: Running shoes may cause damage to knees, hips and ankles and reporting about how running shoes may cause osteoarthritis! Many mainstream newspapers and media outlets picked up the story reporting on how running shoes may cause osteoarthritis. The story almost took on a life of its own. The claims got quite a response on running forums, especially from those who wanted to believe that the story was true. As most runners use running shoes, and if running shoes really did cause osteoarthritis, then runners would have more osteoarthritis that the rest of the general community. Right? No, they don’t. The evidence is really clear: the last time I looked, there was 9 studies that looked at the incidence of osteoarthritis in runners compared to the general population and found no differences. 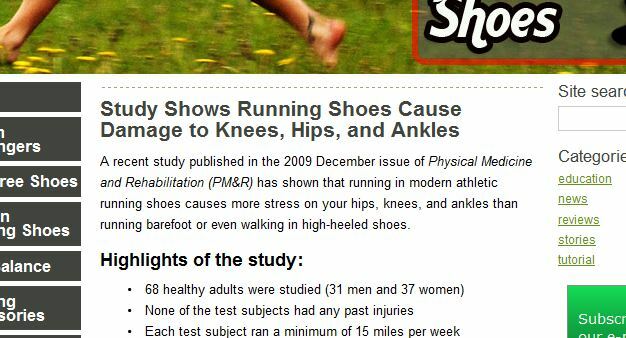 So if running shoes increase the risk for osteoarthritis as these websites claimed, then why are runners not getting more osteoarthritis than the general population? Why did these barefoot running websites deliberately misrepresent the research? Where were the researchers in correcting the misinterpretation and misquoting of their research? We can certainly speculate on the answers to these questions. This was certainly a debacle and those who have been less than honest with what this research showed need to be held accountable. You still see people posting in running forums and on barefoot running sites that running shoes cause knee osteoarthritis based on the myth that came out of this debacle. ¹The increase in the varus knee torque or the external adduction knee moment (pretty much the same thing) is a known risk factor for medial knee osteoarthritis. However, it is just a risk factor and, in general, other risk factors need to be present before knee osteoarthritis develops. The main risk factor for medial knee osteoarthritis is obesity. This suggests that an increase in the varus knee torque or the external adduction knee moment with running shoes may not be an issue unless obesity is also present. Do you know many obese runners? ²In biomechanics of the lower limb, its what I like to call ‘zero sum game’ (for lack of a better word). You can not increase the load in one structure without decreasing it somewhere else. Similarly, you can not decrease the load in one structure without increasing it somewhere else. This study reports the increase in load with running shoes compared to barefoot running (ie it was reduced in the barefoot group). It did not report what loads would have been higher in barefoot running to get a reduction in the load that they reported. Agree completely with this post, that misuse of that paper is a concern. But, if you look at their data and at their figures in the paper there is actually an increase in the EXTERNAL hip rotation torque when wearing shoes. I can not figure out why they’ve written the paper this way and switched the direction. You right! I missed that. Certainly is confusing, so not quite sure what they getting at there. I emailed Casey Kerrigan about this but she did not get back to me. Jay Dicharry was much more helpful (he always is, good guy) but he didn’t provide any insight. Thought I may have been confusing “internal” rotation for “internal” torque produced by the body in response to the external torque which acts on the body. To me this is significant. Most studies (Dorn 2012 most recently) show that the torque in the transverse plan at the hip is an external rotation torque. This means the body is producing an internal rotation torque to balance it (the opposite of what most clinicians, including me, suggest the body does). This means that our hip musculature does not have to actively control femoral internal rotation. There is the possibility that these are all measurement areas and we can’t accurately measure internal/external hip moments.